The Europe Trip. A quintessential rite of passage for any avid traveller, and often the most highly anticipated one. The term ‘Europe Trip’ is obviously hugely vague and for someone who has never set foot on the continent before, it can be overwhelming deciding which countries to hit. 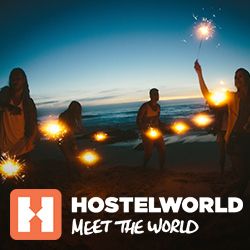 As always, your friends at Hostelworld are here to help. We’ve been all around Europe and experienced its countries for you. Here’s a list of the best places to visit in Europe for anyone planning their first trip there. So bon voyage, viel glück and ole! Ooh la la, no trip to Europe is complete without falling in love with The City of Love itself! Paris is so much more than the tourist attractions… It’s not that you shouldn’t visit the Louvre or the Notre-Dame, and scale the Eiffel Tower when you visit Paris – in fact you would truly be missing out if you didn’t! A nighttime stroll along the Champs-Elysees towards the Arc de Triomphe illuminated against the sky, is nothing short of magical. Better still, be sure to time your evening walk so that you can watch the Eiffel Tower lights sparkle (every hour on the hour until five past). Nonetheless, Paris is a large, diverse city comprised of twenty arrondissements with as many differences as they have similarities. Climb to the highest point in Paris, where the Basilique du Sacre-Coeur (The Basilica of the Sacred Heart of Jesus) stands and enjoy the best view of all the city has to offer. On your way back down through Montmartre’s charming streets, head to Les Deux Moulins café, home to Paris’s most famous film export, Le Fabuleux Destin d’Amélie Poulain! Here you can even order a crème brûlée à la Amélie – be sure to sit outside to soak up the best of Parisian café culture – oh darling! Slightly less well-known, but every bit as worthy of a visit is the Grand Mosque of Paris. Situated a little away from the typical touristy arrondissements, the Mosque – although unassuming from the outside – is one of the most beautiful buildings in the city. After your visit, relax in the courtyard of the adjacent tearoom, where you can indulge in sweet mint tea and traditional pastries. Don’t get too full however, as Paris’s Chinatown (Quartier Chinois) is right around the corner where there are plenty of restaurants and an evening food market to enjoy! Head just a little north afterwards and hit Wanderlust, a popular rooftop bar overlooking the Seine, which often hosts poppin’ club nights featuring a mix of house and hip-hop DJs. If you fancy a real taste of old-school music however, return to Montmartre and stop in at Au Lapin Agile, one of the oldest cabaret bars in Paris. Upon entering the famous bright pink cottage, you will be ushered into a dark piano room and served a glass of cherry wine as fellow patrons fill the empty tables, (which once welcomed the likes of Pablo Picasso and Charlie Chaplin don’t you know!) Customers are encouraged to join in as the show kicks off with traditional chansons françaises, but if you don’t know the words, just sit back and enjoy the entertainment! C’est la vie! London is as diverse as it is iconic with landmarks on every corner and those classic red buses and black cabs zooming down every road. London is one of the most popular travel destinations in Europe with a huge influx of tourists year on year, making it one of the best places to visit in Europe. It’s not all fish n’ chips and pints of ale, Londoners enjoy warehouse raves, pop-up bars, and some of the best South Asian food outside of India. Sure the weather’s always a little sad but don’t let the rain put out your London passion. Spend an afternoon brushing elbows with millionaires in Mayfair and the Saatchi Art Gallery, then head down to Bowie’s Brixton for a grungier, electric affair. There is a deliciously juicy underbelly to London, far away from the tourist attractions. Shoreditch, Brixton and Camden are among the coolest of London’s neighbourhoods and serve as popular hangout spots for young Londoners. Sample street food in Camden and wander along the quirky high street or find out what’s hiding in the shipping containers of Pop Brixton. As the saying goes, a man who is tired of London is tired of life! Top tip: Some of the best views in the city are totally free! Walk along the River Thames, crossing Waterloo Bridge and look out to the London Eye, Big Ben, The Houses of Parliament, The Shard, The Gherkin and basically all the landmarks. Get that perfect skyline photo without spending a dime! One of the best things about Prague is its affordability. In a city where a beer costs you 70 cents and you’ll walk away from a three-course meal with change from a twenty, the possibilities are truly endless. The architecture and grand buildings are also truly breath-taking, and best enjoyed while strolling across the iconic Charles Bridge. In the summer months, hire a paddle-boat and head out across the river, taking in the stunning views as you go. Afterwards, head to the Dancing House, an incredibly funky and iconic bar housed in a cool, leaning building (eat your heart out Pisa!) Once inside, head up to the rooftop bar and enjoy a cocktail. You’ll pay a little more than you will at the other bars in the city but the glass floors and 360 views looking out to Prague Castle are totally worth the extra pennies! Perhaps the most famous attraction in Barcelona is the La Sagrada Familia. Although not yet completed, the idea for this awe-inspiring church was first conceived in 1892. Being such an awesome attraction, La Sagrada Familia is often swamped with tourists and the line can take hours to get inside. Save yourself the drama and book well in advance. Barcelona is a place that has it all, the chic city vibes, the white sand beach and the buzzing nightlife scene make Barcelona a must-hit for any first time Europe trippers! It should come as no surprise that Amsterdam is a city best explored by bike! Thanks to wide (and flat!) cycle lanes lining every street, even the “non-cyclists” among us can enjoy the ride through the canal-side capital. Known as ‘The Venice of the North,’ Amsterdam is decorated with many winding canals – so be careful after a long afternoon in a smokey cafe! Hire bikes from one of hundreds of bike rental stores all over the city and set off in the direction of Vondelpark. Here you can relax in the sunshine, enjoy a picnic or even just go for a ride through this beautiful inner-city park, loved by tourists and locals alike. Alternatively, the iconic Blauwe Teehuis serves lunch on its doughnut-shaped terrace and can be found at the centre of the park. Not far away, the world-famous Rijksmuseum is home to some of the most prestigious artwork on the planet, where you can see work by Van Gogh and Rembrandt, and enjoy a walk around the art-filled gardens. During your trip, it is also well worthwhile to visit the Anne Frank Huis. It is a powerful experience to observe first-hand the Secret Annexe where Anne Frank wrote the diary that was to become such an integral piece of shared world history. In the evening, take a wander along the canals and enjoy a beer at one of many cosy little pubs or cafes, before venturing to the infamous Red Light district. If beer’s your thing, the Heineken Experience is also well worth it. Arguably Amsterdam’s most famous tourist attraction, it will take you on an interactive ride through Heineken’s history, its brewing process and – of course – its taste – so drink up! Berlin is one of the coolest cities in Europe and one of the best places to visit in Europe for first time travellers. The sheer quantity of things to do in Berlin is a draw in itself. Naturally, the city is soaked in history and culture, most of which comes from WW2. We recommend embarking on a free walking tour of the city, learning about the turbulent history whilst also ticking off a lot of the iconic sights. Berlin is infamous for it’s riotous nightlife scene offering a taste of the liveliest clubs in the world, some of which are harder to get into than others. Do your research before you go to find the night that’s right for you, and remember to pre-game in the hostel bar to save money on booze. Berlin enjoys a little sunshine in the summer, and one of the best things to do is to grab a stein of beer and head to one of the happening beer gardens dotted around the city. Prost! San Sebastian – or Donostia, as it is better known amongst its local Basque population – is a small but beautiful city on the northern coast of Spain. Only 20km from the French border, San Sebastian is a must-visit destination for any foodies searching for top, authentic European cuisines. Visit San Sebastian in early summer to experience the stunning La Concha beach at its best – but if you’d rather skip the crowds of tourists and get a real feel for the city, aim for March or October instead. Croatian destinations such as Split and Hvar – whilst much loved amongst European travellers – are a little further off-the-beaten-track than the many globally recognised Western Europe hot spots. This makes discovering these little gems on the Dalmatian coast paramount to the full Europe experience! Start in the large town of Split – an old departure point that has retained all of its Mediterranean charm. Lose yourself amid narrow sloping streets, where drinkers spill out from tiny local bars, sitting atop cushions, boxes or just the cobbled steps. For just a few euros, climb up the bell tower in the town centre and gaze down upon red roofs and the sparkling emerald Adriatic Sea. At the base of the tower is the Piazza, where you can devour an ice cream on stone benches, enjoying whatever street entertainment is on offer that day, or simply people-watch amidst the hustle and bustle. Whilst remaining true to its roots, Split nonetheless knows how to provide for its clamouring tourists, with plenty of bistros and cocktail bars on every square, and several weekly pub-crawls hosted by like-minded hostel workers. For amazing seafood at a fraction of the price you’d pay at home, try Villa Matejuška, a friendly and intimate family-run restaurant close to the seafront. Go for sea bass (“branchin”) if they have it, or even try one of their several top-quality meat dishes. Next stop: Hvar! Take a ferry to the party island and enjoy bars and clubs, including the famous Carpe Diem – an island nightclub accessible only by boat-taxi just off offshore from Hvar Island. By day, tackle the winding walk up to the 16th century Spanjola fortress, from which views of the island are unparalleled. For daytime activities, dive into Ireland’s favourite tipples with a trip to the Guinness Storehouse. Here you’ll learn all about the making, marketing and even pouring of Guinness, as well as enjoying a pint with your newly acquired knowledge and a spectacular panoramic view of the city. Stout not your thing? Visit the Jameson’s Distillery instead and learn about all things Irish whiskey. As well as some boozy beginnings, Dublin’s cultural heritage also boasts some beautiful architecture. Visit (and try not to be intimidated by) the towering St Patrick’s cathedral, or go for a wander around the historic Trinity College university buildings. In the evening, head to Temple Bar for a good old knees up. There’s no shortage of great pubs, bars and clubs to sample, but some good starting points are Bad Bobs, The Palace, The Stag’s Head, The Norseman and Buskers Bar. Every corner of Rome feels as though it should be in a museum. In other cities, architecture that would be regarded as tourist attractions seem bland in comparison to the immense Trevi Fountain, the crumbling Colosseum, and the towering Imperial Forum. Of course, one of Italy’s biggest draws for travellers is the food. Pizza, pasta, and gelato so creamy that Ben and Jerry’s is now ruined forever; one of the best things to do in Rome is simply sample as much delicious food as possible. Sure, you’re likely to leave Rome 15lbs heavier than you arrived, but after your first bite of traditional Italian pizza you’ll soon realise that it’s totally worth it. Rome is also home to the smallest country in the world, Vatican City. Yup, you read that correctly, Vatican City, the historic centre of Catholicism and home to the Pope himself, is in fact it’s own country. The beauty of the Vatican and it’s surrounding bridges is well worth a visit, but be prepared to elbow your way through throngs of tourists! So you’ve hit all the must-see cities, now it’s time to explore the best small cities in Europe for your alternative Interrailing route! The post All The Cities You Need To Hit On Your First Europe Trip appeared first on Hostelworld Blog.